I have a raised bed at the front of my yard, just in front of a large maple tree. I used to grow impatiens there. They did great in the shade; however, they are thirsty little plants. By mid-summer I was having to water every single solitary day—and if it was a little on the hot and dry side, even twice a day. The tree roots from that maple didn’t help either. Inevitably, I’d miss a morning or evening watering and would lose some of the plants, leaving parts of the bed looking a little snaggle-toothed by August. Of course, the deer grabbing an occasional mouthful was another challenge. After a few summers dealing with wilted impatiens, I decided there had to be a better choice. I tried Caladiums instead. Wow! Why hadn’t I tried them before? The colors were gorgeous and they not only thrived in that dry shady bed but I only had to water them once or twice a week—not twice a day. Caladiums are native to the tropical rainforests and equatorial regions of South America from Mexico to Peru. They are members of the Arum family—cousins to elephant ears, calla lilies, philodendrons, and Peace Lilies. One of the best things about the arum family? Critters don’t eat them! 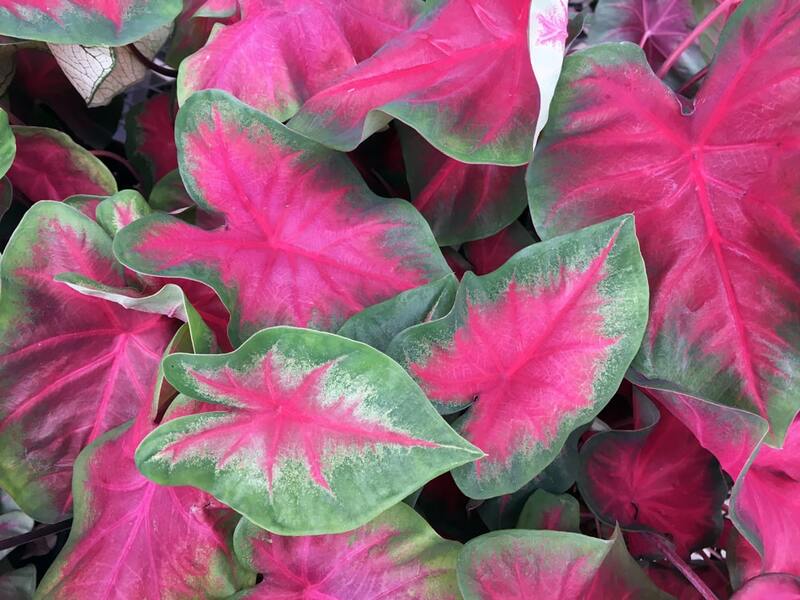 Caladiums are tough, durable and have very few enemies—they’re not particularly fond of strong sunlight, wet feet, and freezing temperatures. The dryer shade under my maple tree is perfect. Caladium tubers come in anytime between the middle of March and the first of April. I pot mine up then so I can get a jump on the season. After all, the sooner you get them started, the sooner you can enjoy them. Once that first leaf opens you’ve got color that lasts all the way until frost. However, you can also wait until the first week in May to plant them directly outside. Because they only need one inch of soil covering them, they’re very easy to pull up just before the first frost. I just give the plant a light tug and it pops right out of the ground. I cut the tops off and let the tubers air dry for a day or two then put them in the bottom of a brown paper bag and roll the top down. That’s it. Toss the bag in the garage, attic, or basement and you’ve got a head’s up on next spring’s color. I wonder how much money I would have saved on my water bill had I tried these years ago…. By the way, if you’ve got a shady damp area you’re unsure what to do with, remember that caladiums have a fabulous cousin called an Elephant Ear. They’re dramatic and tropical and can tolerate shade beautifully, as long as you don’t let them go too dry. Like caladiums, deer, squirrels, rabbits, voles, etc. won’t bother them either! We have a great selection of bulbs for all types of conditions—from sun-loving lilies to summer-long bloomers like dahlias to shade tolerant hardy orchids. Come in and let me help you paint your garden with color! Thank you for the additional information on Caladiums. I learned some things I did not know about them. I have used them in my flower garden before with some success. I think I probably planted too deep and perhaps too much water. Thank you for sharing. YEA for deer not eating them! So much of my front yard is dry shade. They work so beautifully for me.